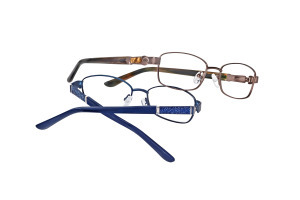 Dallas, November 2014: A&A Optical announces the release of two new petite styles from the Alexander Collection™: Quinn and Molly. Reveal inner grace and sophistication in eyewear inspired by the woman who adorns herself with rich color and style, whether understated or dramatic. Alexander Collection™ offers fine hand crafted details, such as Swarovski crystal accents, metal inlays and delicate laser etching in acetate, metal, semi‐rimless and combination frame styles. Alexander Collection™ is designed to complement women of all face shapes. Petite, average and perfect fit (extended fit) styles are available in eye sizes 47 mm to 57 mm. Mixed Matters. Combination frame Quinn marries unique design with elegant materials. The modified oval frame features a textured metal temple with elongated translucent acetate temple tips. Brushed metal accent strips complete the look. Quinn is available in black, blue, and purple. Size: 48‐15‐135. The A&A Optical brand portfolio includes house brands: XXL, Jalapenos, Cruz, Alexander Collection, and New Globe. Licensed brands include: Quiksilver, Roxy, Jimmy Crystal and Pez. For more information, contact A&A Optical at 800‐492‐4465 or visit www.aaopticalco.com.